00:03 Joel Harford: Welcome to the Two Journeys podcast Bible study questions. I'm Joel Harford, I'm here with Pastor Andy Davis, and the goal of this podcast is to go through books of the Bible, asking questions, verse by verse from the Scripture. Two Journeys exist to help Christians make progress in the two journeys of the Christian life: The internal journey of sanctification and the external journey of gospel advancement. And crucial to that is our internal journey, and going through the word of God as it works on us and builds our faith. And so, I'm here with Pastor Andy Davis and we're going to go through the Book of Philippians. Andy, just from an overview, what can you tell us about the Book of Philippians? 00:42 Pastor Andy Davis: I love the Book of Philippians. I really look on it as an attitude book. Paul, just through four chapters, talks a lot about his attitude, even about life or death. I mean, he's facing his own death in prison and he would, for himself, he'd rather die and be with Christ. But for himself, in terms of his ministry, or for their sake, he'd rather stay and be fruitful. And so, there's no healthier view you could ever have of life or death than, "For me to live is Christ and to die is gain." But he also goes on to talk about his attitude about suffering, attitudes we should have toward other Christians, attitudes of humility, considering other people's needs and goals and desires ahead of your own, attitude of humility like Christ had in Philippians 2, who, being in very nature God, did not consider equality with God something that he grasped, the humility of Christ, attitude about complaining, arguing, making progress in the Christian life, and just almost every topic. It's your demeanor, your attitude that you bring toward these things. And Philippians is a great book, especially known as the book of joy. He talks a lot about joy, rejoicing in the Lord always, and so I love the Book of Philippians. 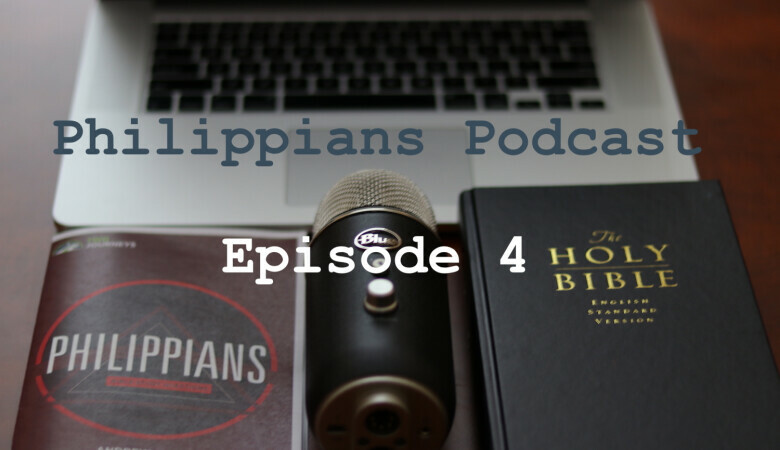 01:48 Joel: Well, for the sake of our audience, I'm going to read today's verses, we're going to be looking at verses 1 through 11, and so I'll be reading out of the ESV from Philippians. "Paul and Timothy, servants of Christ Jesus, To all the saints in Christ Jesus who are at Philippi, with the overseers and deacons: Grace to you and peace from God our Father and the Lord Jesus Christ. I thank my God in all my remembrance of you, always in every prayer of mine for you all making my prayer with joy, because of your partnership in the gospel from the first day until now. And I am sure of this, that he who began a good work in you will bring it to completion at the day of Jesus Christ. It is right for me to feel this way about you all, because I hold you in my heart, for you are all partakers with me of grace, both in my imprisonment and in the defense and confirmation of the gospel. For God is my witness, how I yearn for you all with the affection of Christ Jesus. And it is my prayer that your love may abound more and more, with knowledge and all discernment, so that you may approve what is excellent, and so be pure and blameless for the day of Christ, filled with the fruit of righteousness that comes through Jesus Christ, to the glory and praise of God." 03:10 Joel: So Andy, as this letter opens up, it opens with prayer, how does this help us to pray for other Christians? 03:21 Andy: I think it's very important that we learn to pray scripturally for other people. People don't know what to pray for, actually it says in Romans 8, "We don't know what we ought to pray for, but the Spirit helps us," and the way He helps us is by Scripture, more than anything else, by pointing to the way the Apostle Paul prays for the Philippians or the Ephesians or other places. So Philippians 1, especially 9-11 gives us good things we can pray for other Christians. 03:43 Joel: Now, I probably should have asked this question first, but the letter starts with Paul… Who is Paul? I think all Christians, if you've been studying the Bible, you know who Paul is, but maybe for some people new to the Bible who are listening to the podcast, who is Paul and what is this church at Philippi or the saints in Philippi that they are writing to? 04:02 Andy: Paul, I think some people would say other than Jesus Christ, is the most significant figure in church history, in redemptive history. The Apostle Paul was a Jew from Tarsus in Cilicia, who was trained as a Jew, a Pharisee, he was learning Scripture, sat at the feet of Gamaliel who was a famous teacher of Jewish truth and of Scripture, and was advancing in Judaism, was a persecutor of the church, came to hear about Jesus and rejected him as Messiah, thought he was a false teacher. He was very ambitious, a ladder-climbing Jewish individual who is trying to rise up above anyone else concerning Judaism, and he was very zealous, and he was getting in with the Jewish leaders and received authority from them to destroy the church. 04:53 Andy: And he went from place to place arresting Christians, hauling them off, and persecuting them. He was there when the first martyr, Stephen, was killed, and he was holding the garments of those who stoned Stephen to death, and he was giving hearty approval to his execution. So that was Saul of Tarsus, but suddenly the Lord, by his sovereign grace, confronted him on the road to Damascus, Jesus revealed himself in resurrection glory to Saul and Saul fell to the ground and he heard this incredible voice saying, "Saul, Saul, why do you persecute me?" "Who are you, Lord?" he asked. "I'm Jesus, the one you're persecuting. Now get up and go into the city and you'll be told what you must do." 05:34 Andy: And what he must do was eventually to become the apostle to the Gentiles. A Jewish man who was entrusted with the task of taking the gospel to non-Jews, to Gentiles. We know him best as Paul, I don't think his name changed from Saul to Paul, I think he was known as both names, probably used the name Saul in Jewish circles and Paul in the more Greco-Roman circles, but that's debatable. At any rate, this is who Paul was. 05:58 Joel: Wow, that's an incredible conversion of this man. Now, he addresses the letter to the saints in Christ Jesus. Now, there's a lot of confusion on the word saint, especially with the way that the Catholic church uses the word saints. What is the biblical understanding of saints and sainthood? 06:13 Andy: Sure. I myself was raised Roman Catholic, I went to saint Jeremiah's and saint Anselm's when I was growing up. All the churches in Eastern Massachusetts were named... Almost all of them were named for a saint, although some would be named for the Virgin Mary and there would be different names given, but the saint names were very common. And so, in Catholic understanding a saint is a particularly holy person who probably does miracles, does an astonishing ministry, and then is voted on, I think by the College of Cardinals to sainthood. They're unusually gifted, unusually powerful, unusually holy people. But the New Testament doesn't use the word saint this way. The word saint, I think would be set apart once, somebody who is sacred to God, set apart as God's own possession. It does imply holiness, set apart from the evil of this world, to be God's own prized possession, that's what a saint is, it's a Christian, it's a genuinely converted, a born again individual who is a member of the body of Christ, that's a saint. 07:11 Joel: So actually is you're saying, all Christians are saints and all saints are Christians. 07:15 Andy: Yes, yes. And these initial verses in these Epistles give us that clear indication, To the saints in Ephesus, or to the saints in Philippi, these are just letters to Christians. 07:24 Joel: Now, there's another subset here, it says, "with the overseers and deacons." And I know as we study the New Testament, there are other words with overseers like elder, shepherd. Can you help us understand what is an overseer and what is a deacon? And how are we to understand these roles in the life of the church? 07:47 Andy: Sure, I would say that the... Again, these Epistles give us a sense that there are two offices for the local church, offices of leadership. And I think that we believe there are two and only two. But there are different names, at least for the office of elder or overseer, those are the most common. Presbuteros is the Greek for elder and episkopos, the Greek for overseer. And overseer and episkopos are almost... It's almost like a direct translation. Somebody in a perspective of overseeing the big picture of the flock to see if any are wandering away, not in any way that they're lording it over or they're standing in this austere position of authority, but they're able to see what's happening with individuals and lead them. 08:35 Andy: So these are the spiritual leaders of the church. I think those are just different titles for the same office. And we believe that there are multiple elders or overseers, or pastors or shepherds in one local church, and they work together to lead the church. Deacons, that's almost a transliteration of the Greek word diakonos which means a servant. And so these would take submissive or servant roles under the elder's leadership for the purpose of doing practical ministries that the elders entrust to their care. 09:07 Joel: Now, in verse 2, Paul, he opens all of his letters with this phrase, "Grace to you," and I think sometimes we read over that and say, "Oh, it's in all the letters, it's a standard greeting," but I think there's more than that. Can you explain what you think Grace to you means, why that's special, and why Paul puts that in all of his letters? 09:27 Andy: Grace is the central factor of our salvation. We are saved by grace through faith, and the word to me has a broad meaning. I think the way I'd tend to define it as, a settled determination in the heart of God from before the foundation of the world to do infinite good to people who deserve infinite judgment or wrath. So that's kind of a whole theological definition, and it also is used in relation to specific gifts that flow out of that determination, that God's determined to do us well, like in Psalm 23, "Surely goodness and mercy will follow me all the days of my life," that's grace. God is pursuing you to do you good. And this letter, Philippians, is one of the ways he wants to do good for you. He is going to give you grace as you read the letter. Now, the idea here is that we need grace our whole Christian lives, we need grace for justification, that is to have our sins forgiven, and then we need grace for sanctification, that is to grow and become more and more like Christ, as it says in 2 Peter 3:18, "But grow in the grace and knowledge of Christ." And so these Epistles then are given as instruments or vehicles of God's doing us good. So Grace to you in all these Epistles means God is about to give you grace as you read the words of this epistle. 10:51 Joel: Now in verse 3, Paul, he opens with this thanksgiving, "I thank my God in all my remembrance of you, always in every prayer of mine." What is he so thankful to this group of Christians for? Why do they mean so much to Paul? 11:05 Andy: Yeah, it's an incredible theological point when Paul gives thanks for other Christians, he's really giving credit to God for their salvation. As he says in 1 Corinthians, "It is because of him that you are in Christ Jesus," so we should give him thanks for our own repentance, we should give him thanks for our own faith, we should give him thanks for Christ who died centuries before we are even born, every aspect of our salvation God deserves to be thanked for it. Here, he's specifically thanking God for the Philippian Christians, he gives thanks for their salvation. Paul was the one who planted the church in Philippi, he came over in response to a vision from a man of Macedonia, he met a woman named Lydia, a dealer in purple cloth there by a river and began sharing the gospel and the Lord opened her heart to listen to Paul's message and so God gives thanks for Lydia and he gives thanks for the Philippian jailer that you read about in Acts 16, when he was converted, he and his household. 12:07 Andy: And so, this was the beginning of the Philippian church and Paul just says, "I thank my God for you, I thank God that you're Christians, I thank God that we're brothers and sisters that will spend eternity together, I love you, I enjoy spending time with you and I have so many remembrances of you. So, whenever I remember you, I just thank God for you." 12:25 Joel: And what about this partnership? He says, "Because of your partnership in the gospel…" What was this, the nature of this partnership? 12:33 Andy: Well, he's going to say at the end in chapter 4 that from the very beginning of his ministry, they were about the only church that supported him financially, they shared with him financially. And so the first basis here, I think the whole epistle is in a simple way, a thank you letter for money that they sent by Epaphroditus. As we go on in our studies, we'll see that in chapter 4, he's thanking God for the gifts they sent, that's money. So gold and silver coins, things like that. Because just life takes money, for food and clothing and shelter and different things, and they supported him, so they were partners in his ministry, by giving him money, they freed him up from tent-making or from other things so that he would have the freedom to preach the gospel in Thessalonica or in Athens or Corinth or other places. And so from the very beginning, they were partners or sharers with him practically in the gospel ministry but more than that, they were heart and soul partners with him, they were excited about the preaching he was doing, they enjoyed hearing stories of people being converted, so they were sharers or partakers with him of the gospel. 13:34 Joel: Do you think that should inform how we in a church today view our relationship with those who have gone out to take the gospel where Christ has not been heard, our partnerships with missionaries? 13:47 Andy: Yeah, I think that's vital. I think we need to realize that one of the reasons and the purposes of God in all of redemptive history is to take the gospel to the ends of the earth to those who have never heard the name of Christ. As it says in Luke 24, "That this is what is written, that the Christ would suffer and rise from the dead, and that repentance and forgiveness of sins would be preached in His name to all nations beginning at Jerusalem. You are witnesses of these things." Now, some people are specifically charged to sell all their possessions, leave their home countries and get on planes these days, and go to distant countries and tell people who have never heard the name of Jesus, to tell them of Christ. Those who do not go they're not called to go who are called on, it says in Thessalonians, "To mind their own business and stay at home and work hard with their own hands," they're under obligation to share in the ministry of taking the gospel to the ends of the earth. They're not going to go, but they enable other people by their financial gifts to go. So yeah, I think we ought to be partakers or sharers with them by sacrificially giving money and by praying for missionaries that we send out. 14:52 Joel: Yeah, as you mentioned prayer, the verse that is coming to my mind was in... I think it's 2 Corinthians where Paul says, "You also must help us by prayer." 15:01 Andy: I love it. It's great. It's powerful. 15:02 Joel: And so, you have that partnership of financial partnership in Philippians and also prayer partnership. 15:09 Joel: So Paul mentions his afflictions, actually let's do verse 6 first. Verse 6 is incredible, let me read it, he says, "I'm sure of this, that he who began a good work in you, will bring it to completion at the day of Jesus Christ." Why does this verse so great for giving us assurance? 15:31 Andy: Yeah, I think in context, the simplest application of this is that their initial interest in his ministry, as shown by their financial support from the beginning and which has now been repeated now, that at that level they'll continue to share in the gospel advance by financial sacrifices better. But most Christians read it far more broadly than that. That really has to do with our salvation, that He who began a good work of salvation through justification, that's where it begins. 16:02 Joel: He began the good work of faith. 16:03 Andy: He began the good work of faith, He began the good work of their repentance. He's going to broaden it and expand it and continue the work of salvation fully and completely until the day of Christ Jesus. He doesn't start things and then is unable to finish. We know the story, I think, in the Gospel of Luke, about counting the cost and he said, "No one begins a tower and then runs out of money." I mean, he ends up becoming a laughing stock to the community, it's like, "Well, he ran out of money, he didn't calculate." Or a king who hears that he's invaded finds out how large the invading army is and counts his own men and if he doesn't have enough men to take him on, he counts the cost and says, "We're going to lose, he goes out and sues for peace." 16:45 Andy: So those are stories of someone that would begin something and they can't complete it, but God is not that way, He has infinite resources and He is capable of not only beginning our salvation, but carrying it on to completion till the day of Christ Jesus. And so that gives us a strong assurance. He started this work in us, we didn't start it, he started it, and he's going to finish it. He is the Alpha and the Omega, He's the first and the last, the beginning and the end of our salvation. 17:09 Joel: Alright, now Paul talks about some of the trials he's faced, he's grateful to them, he says, "I hold you in my heart, you're partakers with me of grace, both in my imprisonment and in the defense and confirmation of the gospel." Let's first talk about Paul's imprisonment. As far as you know, how many times is he in prison and what was that like? 17:31 Andy: I haven't counted them, I think there are probably some New Testament scholars that have gone through, but you'd have to read through all of his Epistles and find out how many times he refers to being in prison. He seems that way here in Philippians and in other places as well. So the idea here is that Paul was again and again in prison for the gospel. I think it's true that there's no one (I would say for myself in my studies), there is not a single person I've ever studied in church history that suffered anywhere near as much as the Apostle Paul. 18:00 Andy: No one started as many riots, no one was imprisoned as much as him, no one was beaten or tortured as much as him and no one who having had all those sufferings then finished it with martyrdom. I mean, he trumps basically every other card in the deck other than Jesus Christ. So he suffered a great deal, and they saw that from the beginning, he was imprisoned in Philippi, they saw it with their own eyes. The Philippian jailer did it to him, he was involved in his imprisonment. So they shared with him in his imprisonment from the beginning and at the end of this chapter, he's going to say, "You're going through the same struggle and so some of you might end up pretty soon or already are being imprisoned for the gospel too. 18:40 Joel: Now, what about this defense and confirmation of the gospel, what do you think he's telling us about? 18:46 Andy: Well, again, at the end of the chapter, he's saying he wants them not to be frightened in any way by those who oppose and that confirms the truth of the gospel. Christ is risen, our sins are forgiven, we need fear nothing, there's nothing that man can do to us, Jesus said, "Don't fear those who kill the body and after that can do nothing to you, but I'll tell you who to fear, fear the one who after the destruction of the body has the power to destroy both soul and body in hell," that's Almighty God. But now that God has been reconciled to us, and we to God, He's at peace with us, we have received grace from Him, we need fear no condemnation, we're not going to go to hell when we die. And so this confirms the truth of the gospel, our courageous testimony to the truth that Christ is risen, that's the defense and confirmation of the gospel. The gospel is confirmed by fearless witnesses who say, "Christ is risen, we have no fear of death, and you also can live forever if you repent and believe in Jesus." 19:41 Joel: Now, Paul, says in verse 8, he says, "For God is my witness, how I yearn for you all the affection of Christ Jesus," and he says, "It is my prayer that your love may abound more and more with knowledge and all discernment." We see here that this love would abound more and more, but also with knowledge and discernment. Why are both of these important and one without the other is really going off into error? 20:05 Andy: Yeah, for certain we combine truth and love, they go together in Christianity. We know the truth, and then we love the truth. You have to know it first, knowledge comes first. I mean, you can't love something you don't know anything about, you can't love a person you know nothing about. If I told you a name of a total stranger and said, "Do you love him or her?" It's like, "I don't know anything about him." So we learn first the truth and then we, by the power of the Holy Spirit, grow to love the truth, and what he wants there is he wants them to know more and more of the truth so that their love might broaden and deepen as well. There is an infinite dimension of the love of God for us in Christ and we conversely can grow in our love for Him, but we do that by knowing the truth. 20:56 Andy: And so he wants them and he prays for them and he teaches them to the end that they would know more Christian doctrine and that they'd be aware of the truth of Christianity more and more. And so, they would have deeper and deeper insight and that as a result, their love would be broader and more amazing, that they would realize just how amazing a savior Jesus really is. In chapter 3, he's going to say, "I want to know Christ." It's like, "Well, Paul, don't you know Jesus?" "Yes, I know him. I would be a liar if I said I didn't know him, but I don't know him enough." So he wants his own knowledge to grow and grow and then his love will grow more and more, same thing for them. 21:34 Joel: Now, what about this discernment, knowledge with all discernment? And then he says, "So that you may approve what is excellent," in verse 10. So why is discernment so important in the Christian life? 21:45 Andy: Well, we're surrounded by deception. We ourselves are easily deceived and so discernment is maybe just another word for wisdom, it's the ability to see the truth between one path and another, a wise and a foolish path, to see through the deceptions of the devil. Sometimes it's really just a matter of good, better, and best. Sometimes you have to discern between something that's better than good, and something that's best compared to something that's better. And so one of the hardest things in the Christian life is to make that kind of judgement call, these two paths would be good, but this one is the best of them all. And so he wants them to be discerning, he wants them to discern between good and evil, and then he wants them to discern between good, better, and best for their own lives. There's only so much time, energy, and money they have, and they need to be wise stewards and go in the best possible direction and that's going to be different for each of them because they have different spiritual gifts and different calling, but they need to be discerning about how best to invest their life. 22:42 Joel: Now, it speaks of the day of Christ. What is the day of Christ? 22:49 Andy: Well, I think you could look at that either as the second coming of Christ or judgment day. Jesus is the central figure in both obviously. The second coming of Christ ends human history. Jesus returns in the clouds and every eye will see him, even those who pierced him and all the nations of the earth will mourn because of him. The end has come, second coming, that's the day of Christ, the end of all things or we could look on it as judgment day, when Jesus said in John 5, "All judgment has been entrusted to the Son." And as it says in Matthew 25, "When the Son of Man comes in his glory and all the angels with him, he will sit on his throne in heavenly glory, and all the nations will be gathered before him and he will separate the people." He's going to judge them, so that's the day of Christ. 23:29 Joel: So there's a judgment day coming. This is a very scriptural idea. 23:33 Andy: Yeah, absolutely. Yes, and that's the day of Christ Jesus. 23:36 Joel: So I'm putting these together now. Paul is praying that they'll get ready for judgment day. We started by saying, "How does this help us pray for each other?" Well, how does this section help Christians pray and minister to other Christians? 23:56 Andy: Well, first, we just need to be aware that judgment day hasn't come yet. And we have yet to be finally saved from God's wrath. And so Romans 10 says, "How much more will we be saved from God's wrath through him." So that final salvation from wrath, which is depicted in other Scriptures such as "Depart from me you who are cursed into the eternal fire prepared for the devil and his angels," that's the final pronouncement of judgment and wrath. We will be delivered from that, but it hasn't happened yet. So, for us, we need to run this race with endurance, we need to be aware of holiness issues, and sin issues in our lives. We need to, as Jesus says, cut off our right hand if it causes us to sin so that we not be cast into hell. There's a life of holiness. So we need to be ready for the day of wrath, the day of judgment, and help each other, but also having been delivered from condemnation, there's no condemnation for us, we're not going to be condemned, we don't have to fear hell in that way. We want to be maximally fruitful, we want to have as much treasure in heaven stored up, we want to have as many good works, we want to live broadly fruitful lives with a vast harvest of good works, and so we help each other to be rich on judgment day by spurring one another on toward love and good deeds. 25:13 Joel: So I think you've answered my next question, I was going to reference verse 11 where he says, "Filled with the fruit of righteousness..." So you're saying rich in good works, rich in the fruit of the spirit and in sanctification. 25:24 Andy: Yeah, I would say I heard once one preacher said, "There's action fruit and attitude fruits," and I might reverse that a little bit, there's attitude fruit and action fruit. And I said earlier that Philippians is the attitude book, so I also like the fruit of the Spirit: Love, joy, peace, patience, kindness, goodness, gentleness, faithfulness, and self-control. Those are attitudes or demeanors of the soul, that's fruit. To have a more and more loving demeanor, more and more peacefulness in your heart, this is genuine fruit in your life. 25:53 Andy: So if you're on a deck of a ship, and there's a heaving storm and the Lord speaks peace in your heart, and you are much more peaceful and you're not afraid to die like you would have been earlier, that's fruit. You're really not doing anything but you've got a peacefulness in your heart in the midst of a storm in your life, but then there's action fruit where you're actually sharing the gospel with others, you're growing in your prayer life, you're raising your children in the nurture and admonition of the Lord, you are being a good employee of a company, you're a fruitful church member doing spiritual gift ministries, that's all fruit. 26:28 Joel: Now he says, "Filled with the fruit of righteousness through Jesus Christ to the glory and praise of God." How is all this to the glory and praise of God? Before you answer, I know when I started hanging around this church, people would talk about, “What is the chief end of man?” The glory of God. And I never had actually heard somebody say that, and so I was a little taken aback and I said, "Is that really in Scripture?" But then the more I studied, the more I realized there's only one or two super overt statements, but it's all through the Scripture, that everything is for the glory of God. Can you talk about that? 27:05 Andy: Yeah, the glory of God is the radiant display of his perfections or his attributes. Attributes are descriptions, like adjectives that answer the question, What kind of God do we love and serve? He's a holy God, a righteous God, a just God, a powerful God, a wise God, all of those are attributes. So when God is glorified he's put on display, people can see what kind of God he is. When we glorify God, we're putting him on display. So Jesus says, "Let your good work shine before others, that they may see your good deeds and glorify your Father in heaven." So they look at us and they say, "Your God must be a loving God, you've loved me," or, "Your God must be a patient God, you've been very patient with me." So all of our good works are to the glory and praise of God. But let's keep it even simpler. We can do no good works apart from Him. 27:56 Andy: So it says in John 3, "Everyone who does evil hates the light and will not come into the light for fear that his deeds will be exposed, but everyone who lives by the truth [those are Christians], comes into the light, so that it may be seen plainly, that what he did has been done through God." Just like in Revelation 4, the elders are casting their crowns down before the throne, their crowns represent their achievements, their good works, their own glory, and they give credit to God fully by casting their crowns down before Him. And so the idea there is that we, our good works, our harvest of good works is to the glory and praise of God, so that God gets the final glory. 28:38 Joel: That is beautiful. He empowers us to do works, then he gets the glory, praise due on Him. It's beautiful. 28:42 Andy: And we get the joy. He gets the glory, we get the joy. 28:45 Joel: Yeah, we get the joy. Any final thoughts on Philippians 1:1-11? 28:50 Andy: Yes, so what I would commend is that you go back and look at verses 9-11 and pray for three or four Christians that you know, pray these words. Pray that their love may abound more and more in knowledge and depth of discernment. Just pray through 9-11. It could be your spouse, it could be one of your kids, it could be a friend, it could be your pastor, just choose three or four people, and just pray those words that will broaden and make more specific your prayer life. 29:17 Joel: Well, this is the Two Journeys podcast going through Philippians, the Bible study questions, there's a companion guide in a series that Andy has written called, Bible Study Questions, and most of these questions come from them. So if you're using that for your personal Bible studies or for Bible studies with your church, you can follow along. Please join us next week, we will look at Philippians 1:12-30. Again, this is Two Journeys. Two Journeys exist to help Christians make progress in the two journeys of the Christian life: The internal journey of sanctification and the external journey of gospel advancement. Thank you for listening, and God bless you all. Thank you for listening to this resource from twojourneys.org. Feel free to use and share this content to spread the knowledge of God and build his kingdom, only we ask that you do so for non-commercial purposes and in accordance with the copyright policy found at twojourneys.org. Two Journeys exist to help Christians make progress in the two journeys of the Christian life: The internal journey of sanctification and the external journey of gospel advancement. We do this by exporting biblical teaching for the good of Christ's church and for the glory of God.